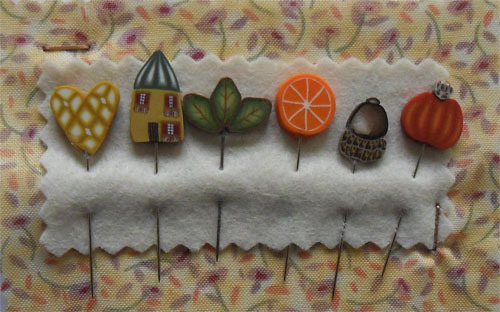 Purely decorative, these charming pins are hand-made in France with polymer-clay; they achieve an absolutely stunning level of detail. as you would use your usual pins to enjoy them while working (with special care of course as they are obviously more delicate than your usual pins). They make also a nice gift for a fellow stitcher as they are so nicely displayed in their little white pocket written "made in France" on the back. Please note the head of the pins is removable (if you take the head in one hand, the pin in the other and yank, the head will come out). Some French stitchers leave them this way as it allows to change the pin when its tip has become blunt; other prefer to superglue the heads. It's up to you!